The library owns several audiobooks in support of academic programs. 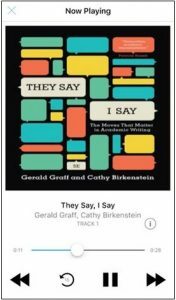 They Say, I Say: The Moves That Matter in Academic Writing by Gerald Graff and Cathy Birkenstein. In addition to audiobooks available from OneSearch, you can freely access thousands of public domain book recordings from LibriVox. Volunteers record texts of titles that are no longer subject to copyright restrictions, making this service a great resource for finding the audiobook version of your favorite classic. 1. Enter the book title in OneSearch. 2. In the left column will be options for limiting your search. Here, you can limit the Source Type to “Audiobooks.” You may need to click “show more” to see the audiobooks option. You will be prompted to log in to your OneSearch/EBSCO Account. If you have not already done so, you will need to create a personal account (link in upper, right-hand corner). Select the number of days (up to three) you would like to check out the audiobook using the drop-down menu. Note: If an audiobook is unavailable, you can place a hold on the title. To access your audiobook, you will need to complete a one-time download of the EBSCO Audiobook app for your Android or Apple device. Once you have completed the download, login to the app using your OneSearch/EBSCO account. Click sign in. Using the app, select the title you wish to download. Once you have downloaded the audiobook, select play. From here, you can pause, skip back fifteen seconds, or move to different sections of the book. Your audiobook will automatically expire at the end of the checkout period. If the audiobook you have selected is already in use, you may place a hold on the title. This will allow you to check out the audiobook when it becomes available. To place a hold, enter your email address, and select Place Hold. You will be notified via email when the Audiobook is available for checkout.